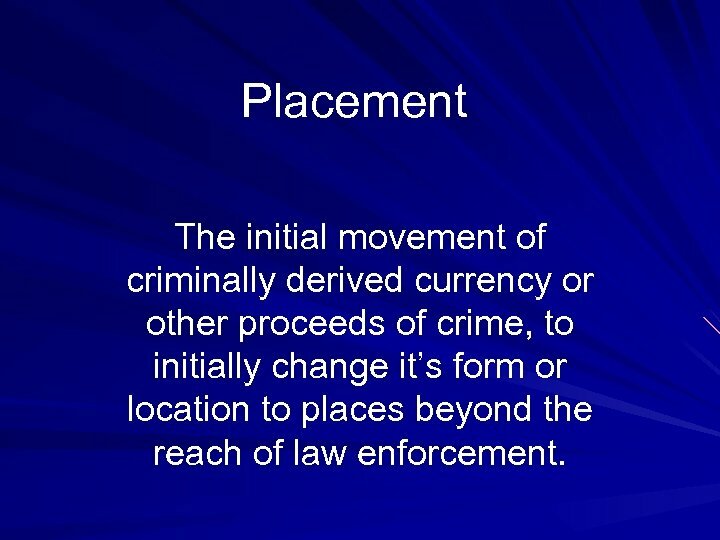 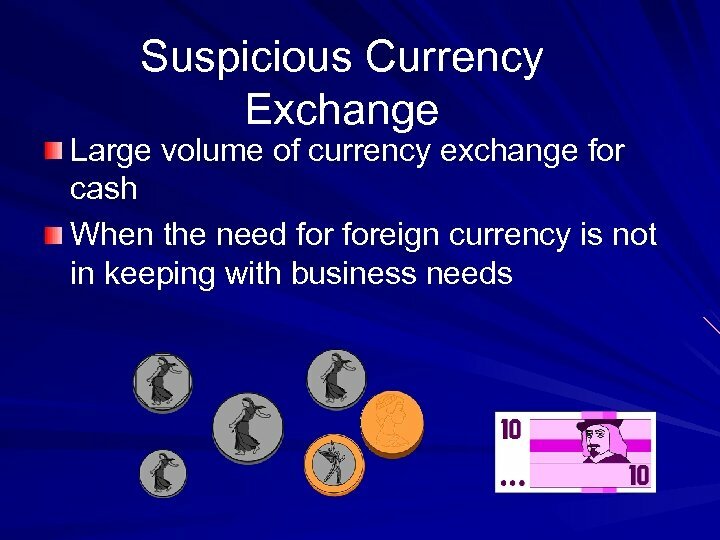 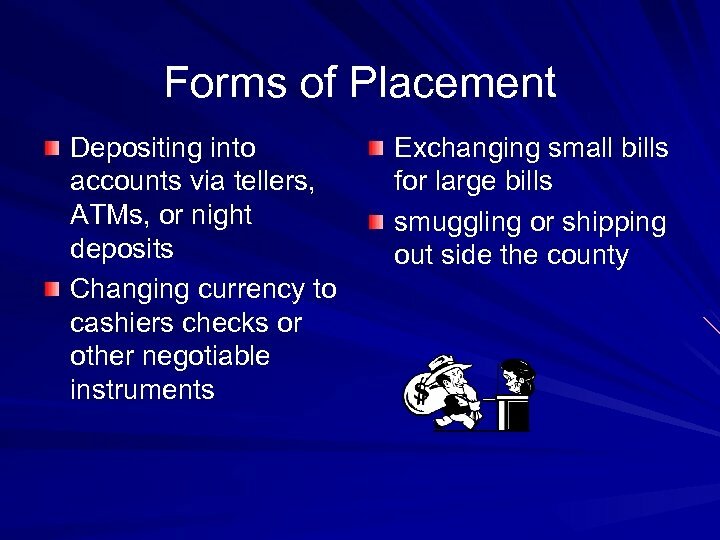 Placement The initial movement of criminally derived currency or other proceeds of crime, to initially change it’s form or location to places beyond the reach of law enforcement. 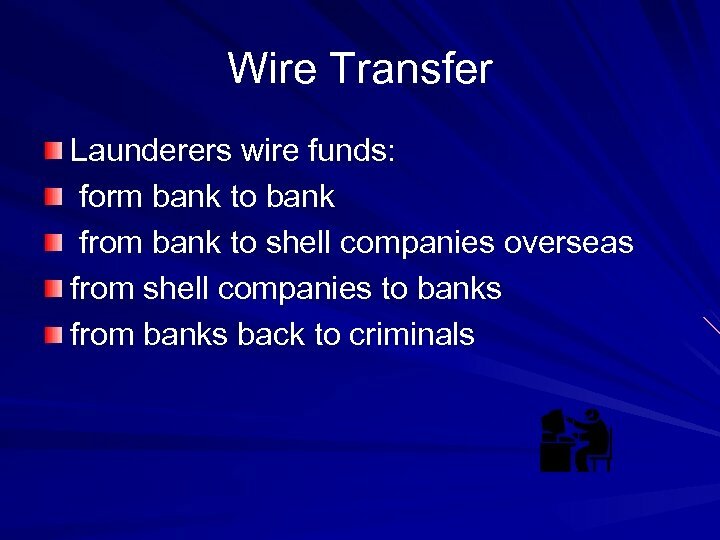 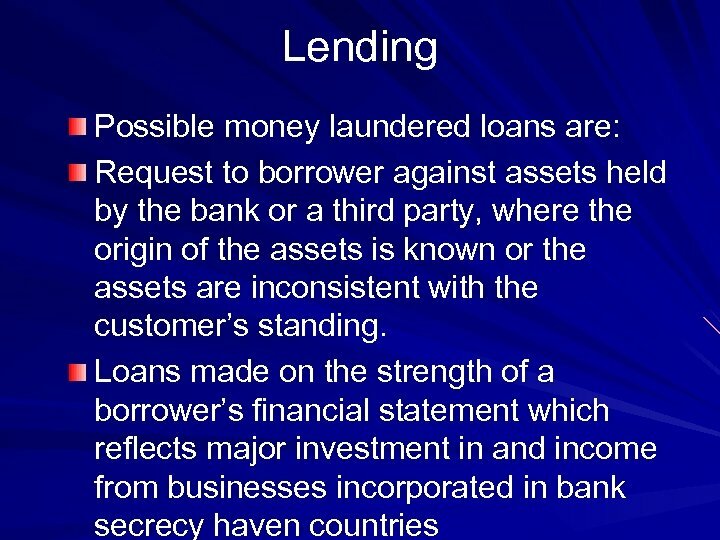 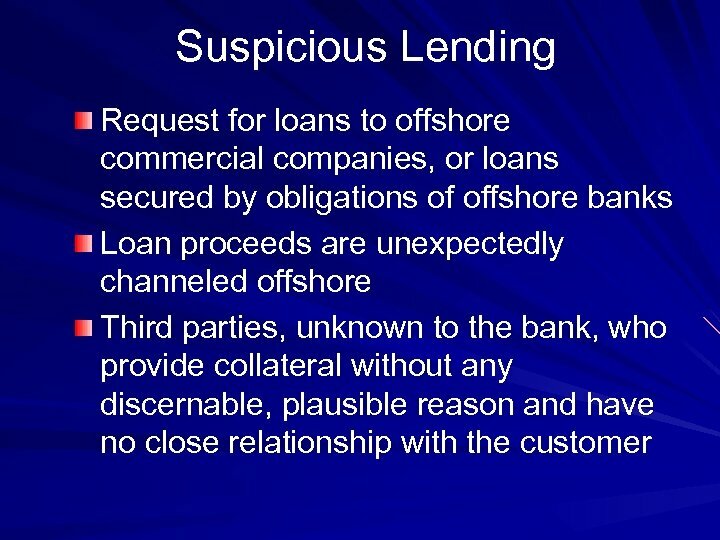 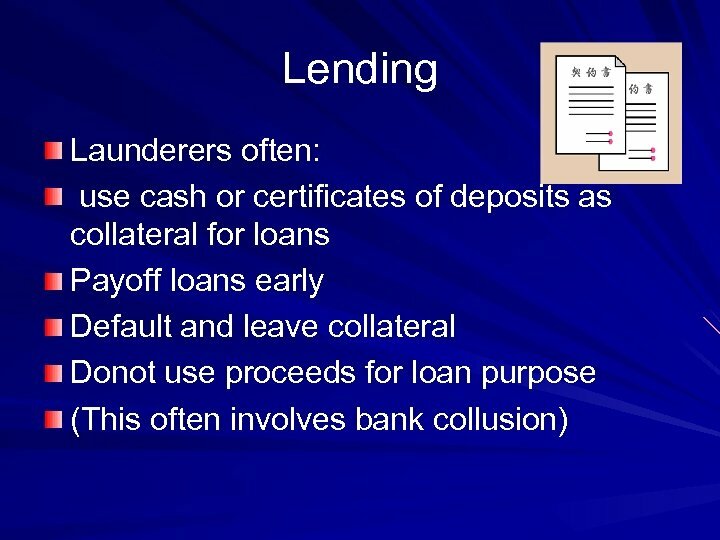 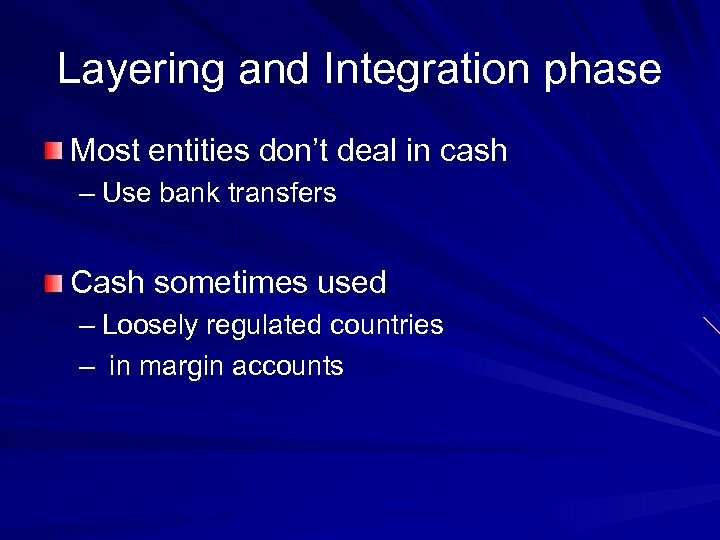 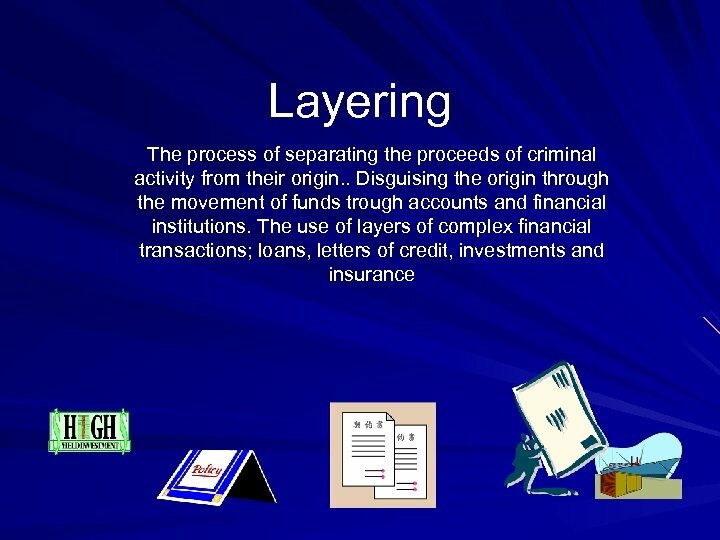 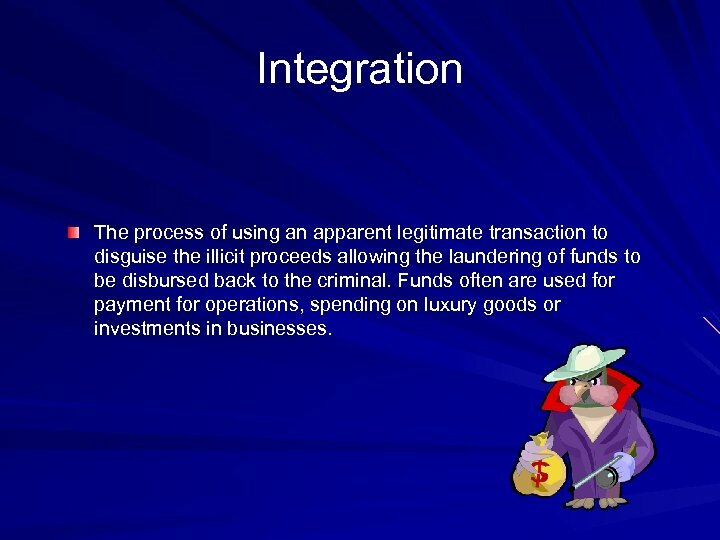 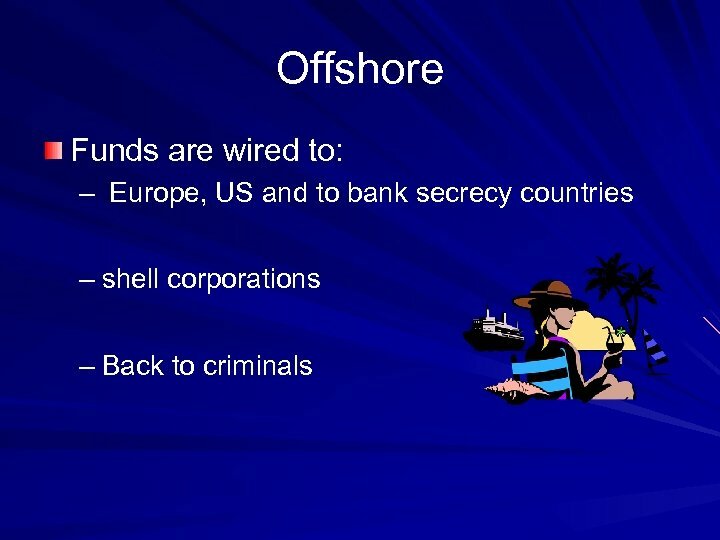 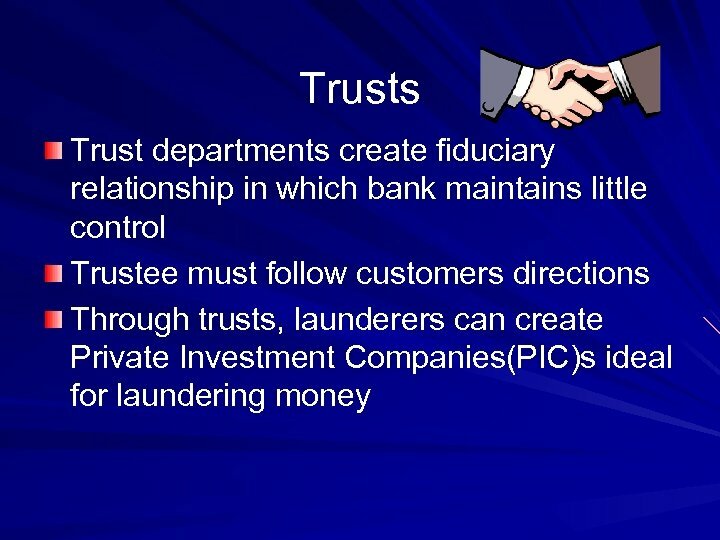 Integration The process of using an apparent legitimate transaction to disguise the illicit proceeds allowing the laundering of funds to be disbursed back to the criminal. 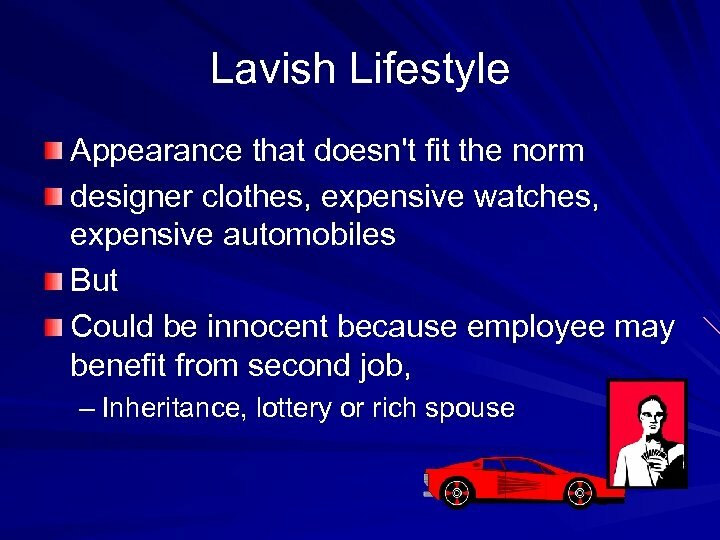 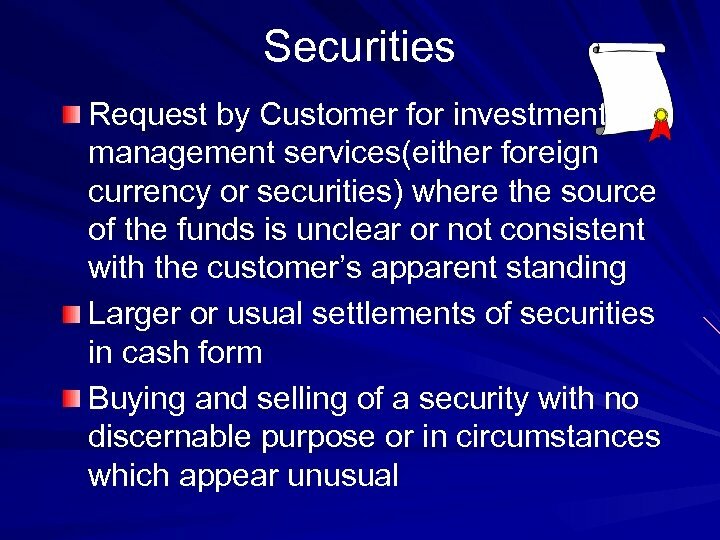 Funds often are used for payment for operations, spending on luxury goods or investments in businesses. 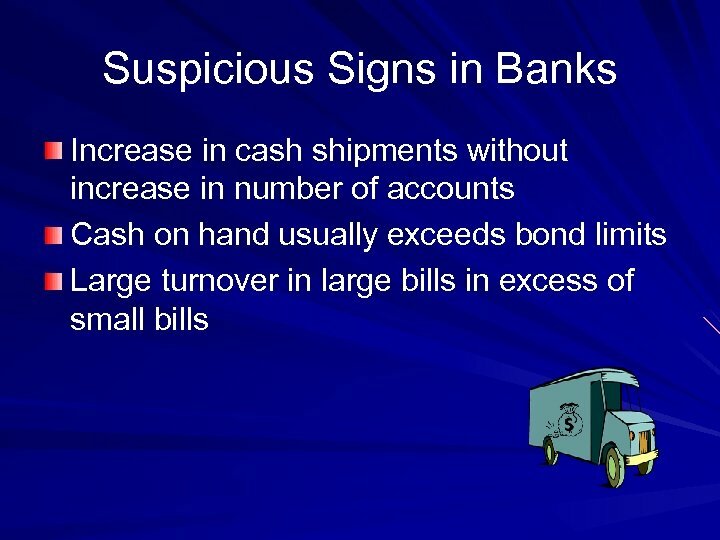 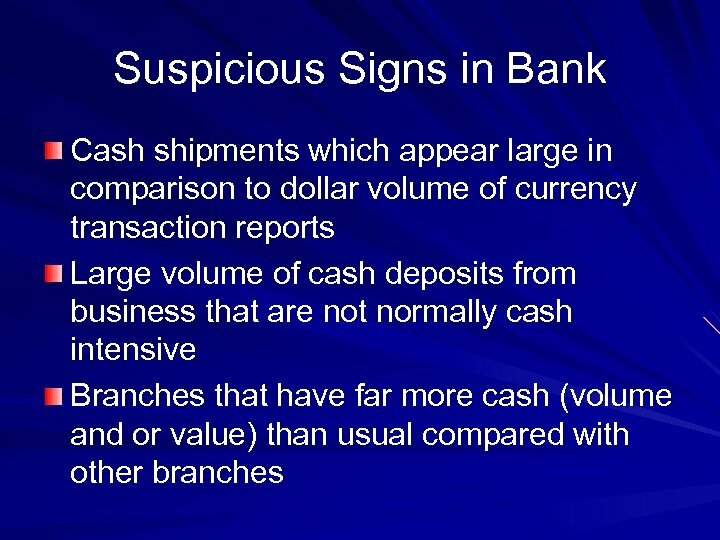 Suspicious Sale of Monetary Instruments When large volume of cashiers checks, money orders or travelers checks are sold for cash. 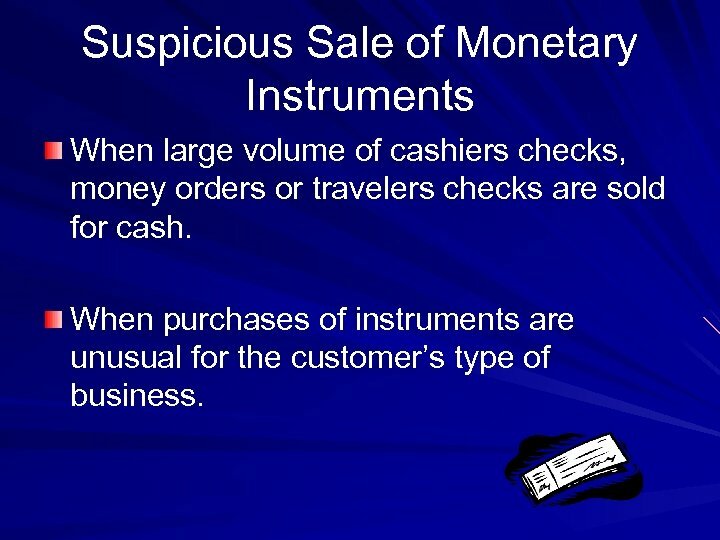 When purchases of instruments are unusual for the customer’s type of business. 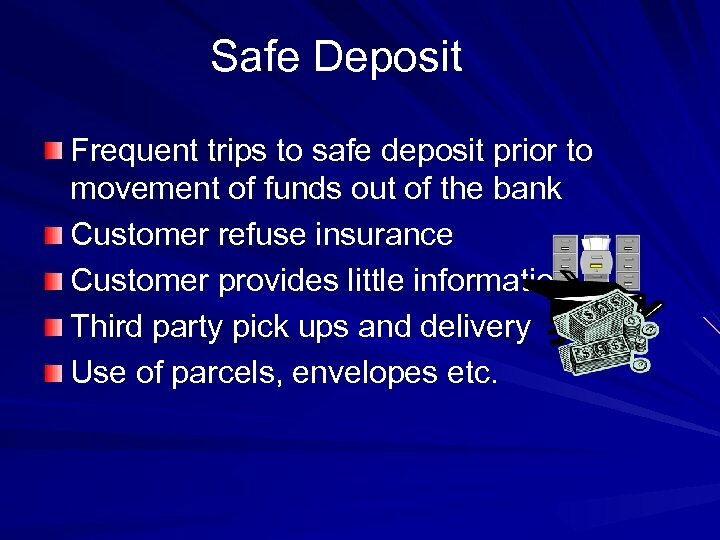 Safe Deposit Frequent trips to safe deposit prior to movement of funds out of the bank Customer refuse insurance Customer provides little information Third party pick ups and delivery Use of parcels, envelopes etc. 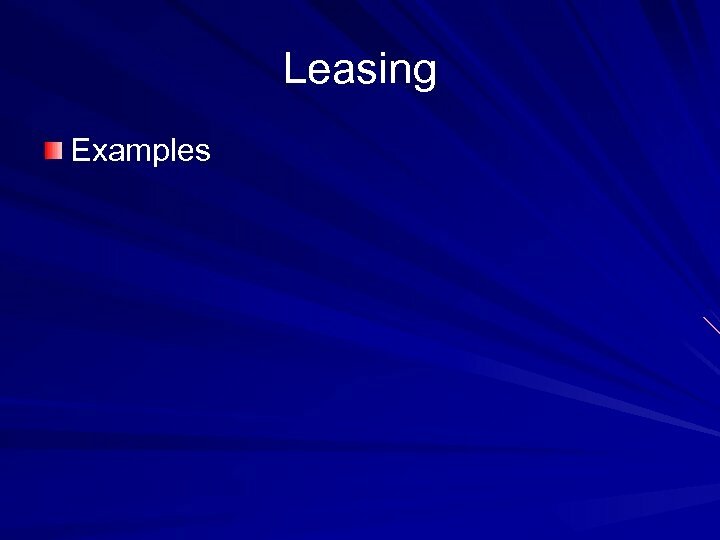 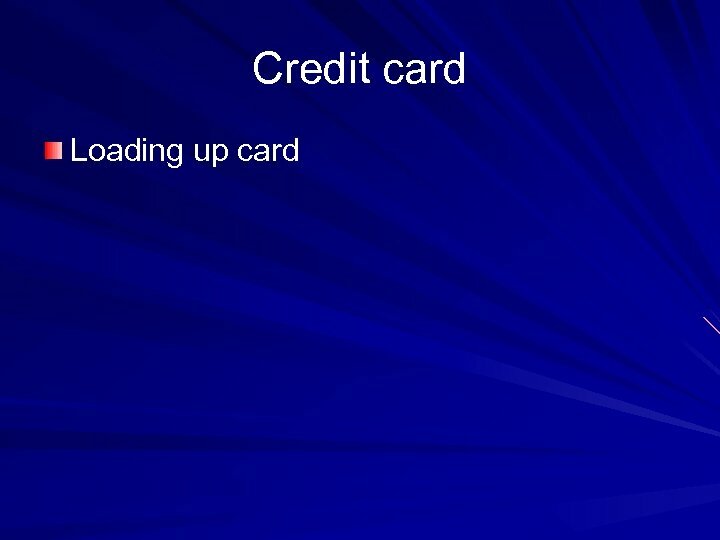 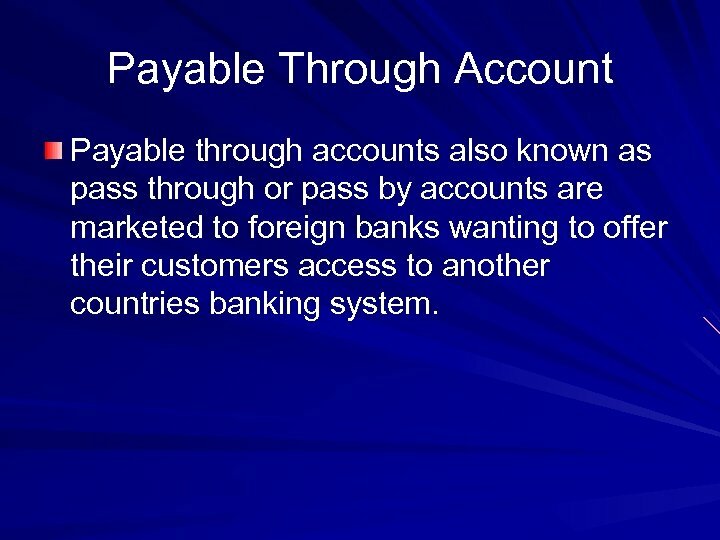 Payable Through Account Payable through accounts also known as pass through or pass by accounts are marketed to foreign banks wanting to offer their customers access to another countries banking system. 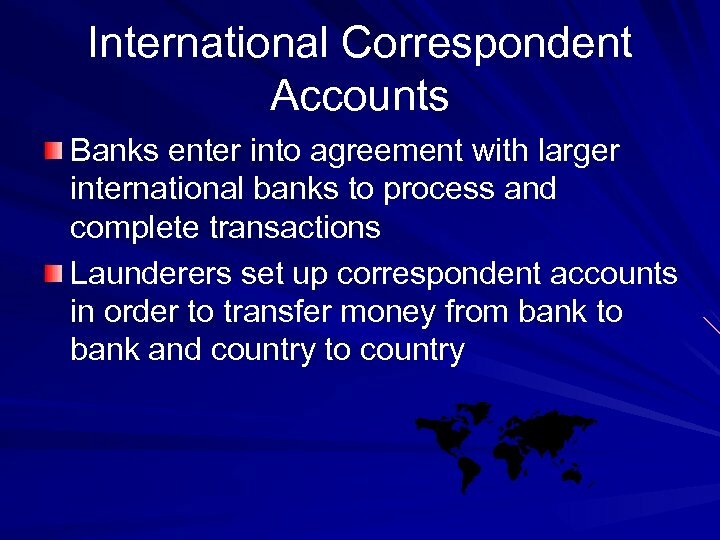 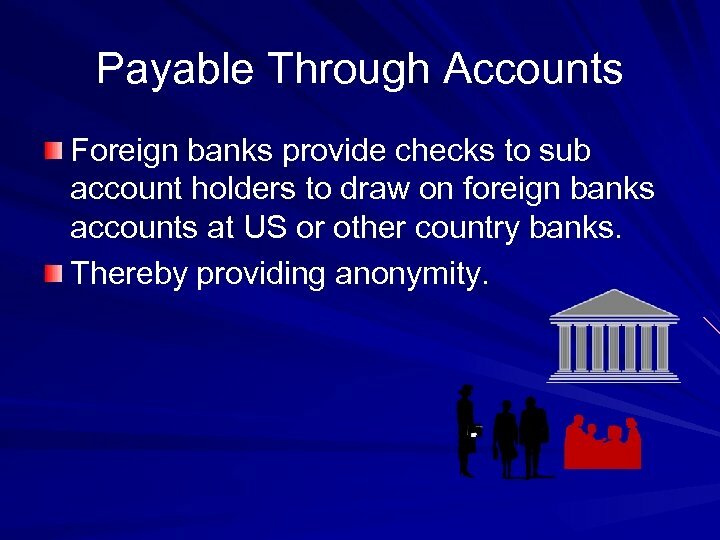 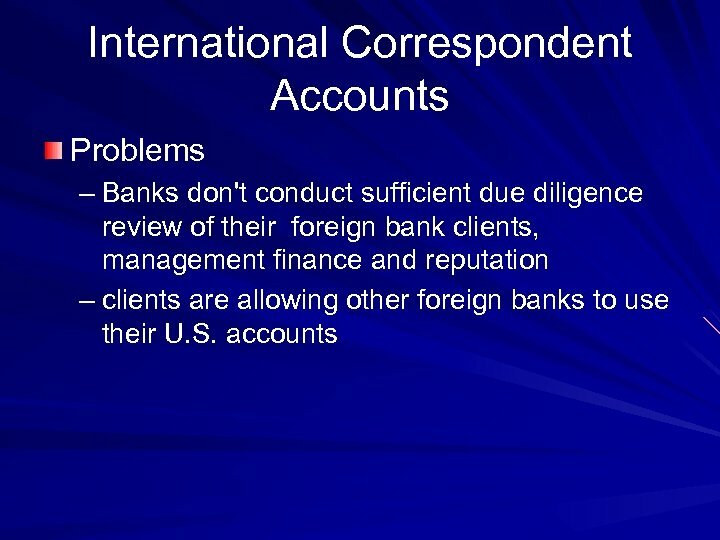 Payable Through Accounts Foreign banks provide checks to sub account holders to draw on foreign banks accounts at US or other country banks. 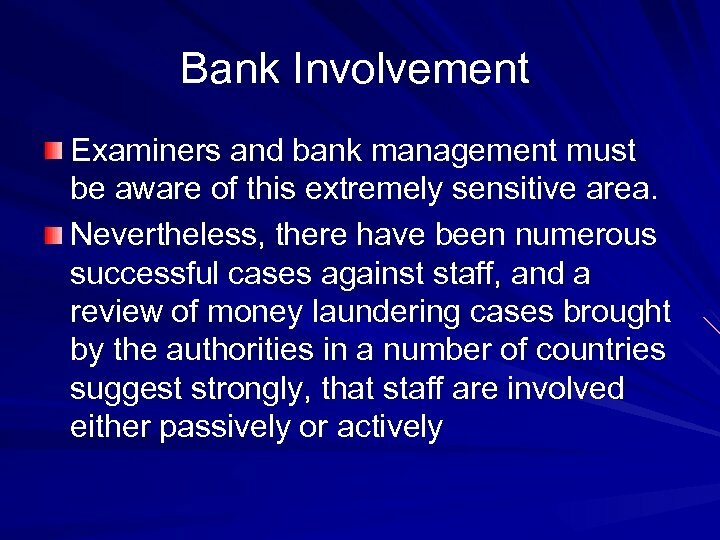 Thereby providing anonymity. 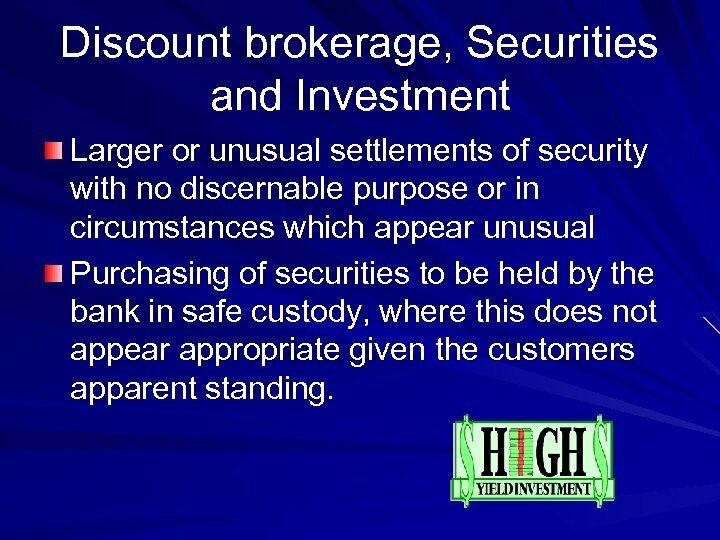 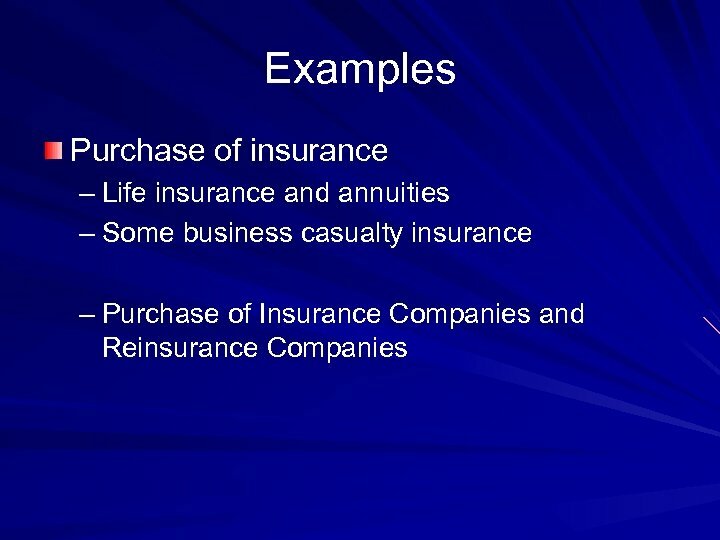 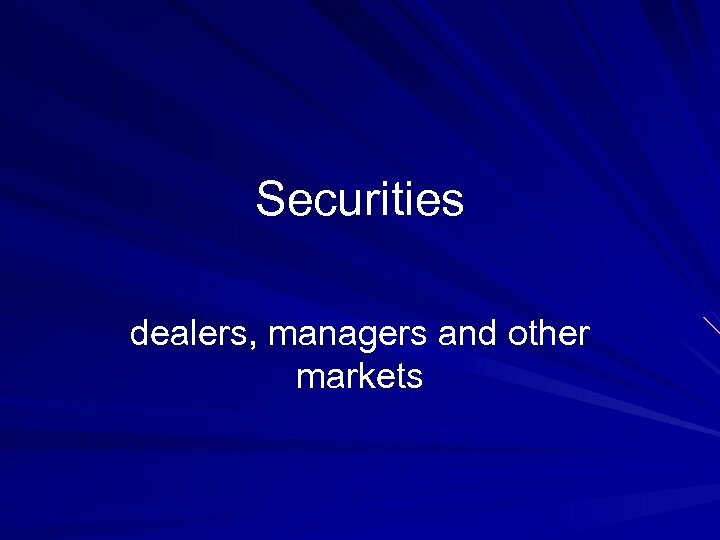 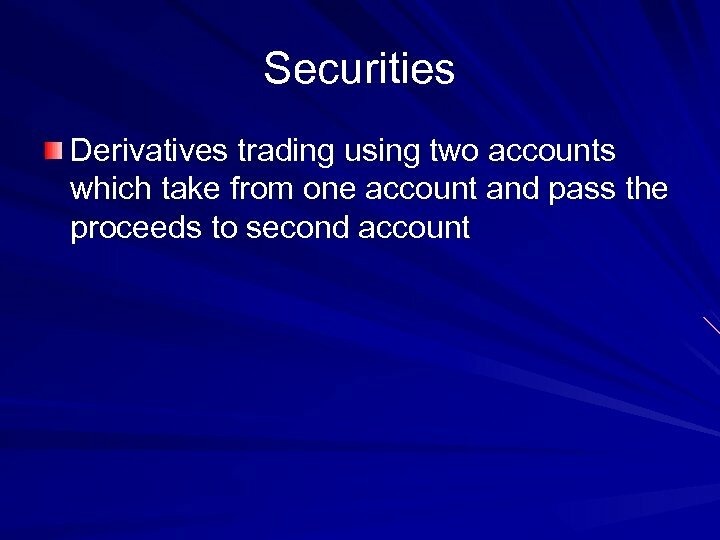 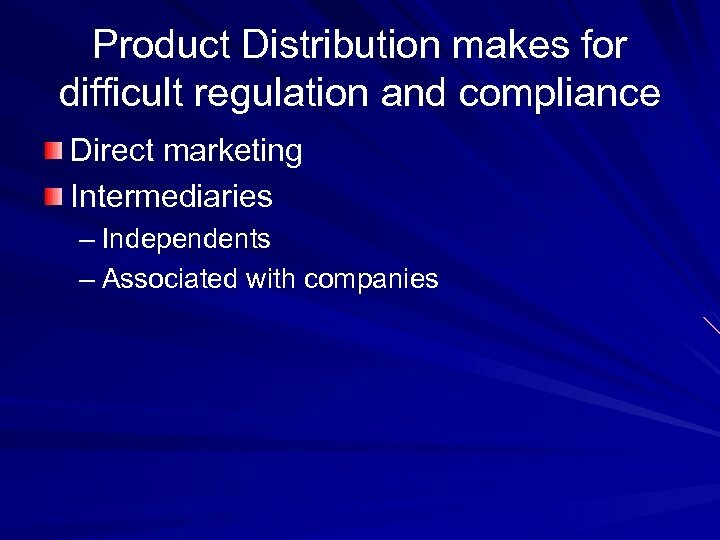 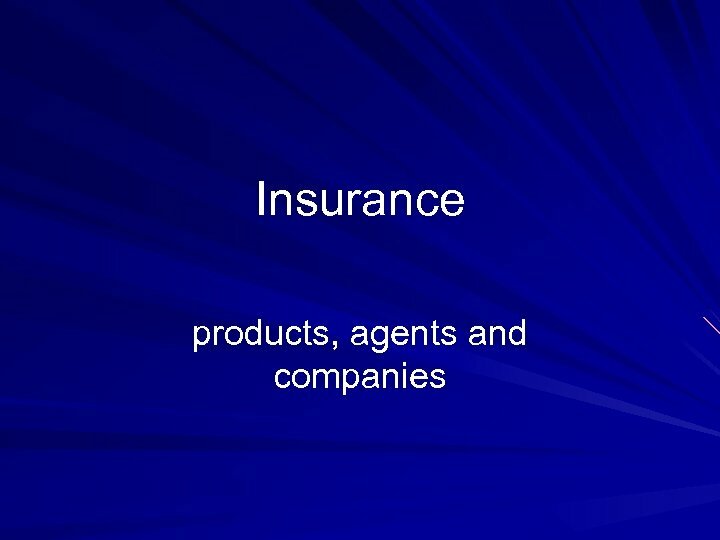 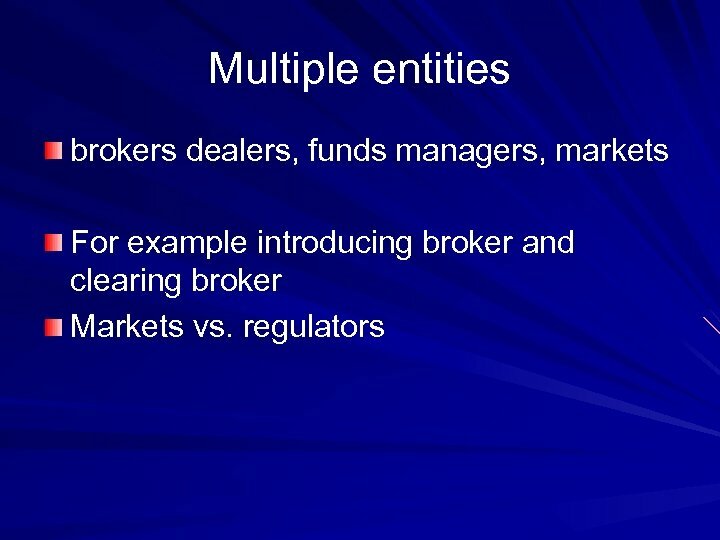 Discount brokerage, Securities and Investment Larger or unusual settlements of security with no discernable purpose or in circumstances which appear unusual Purchasing of securities to be held by the bank in safe custody, where this does not appear appropriate given the customers apparent standing. 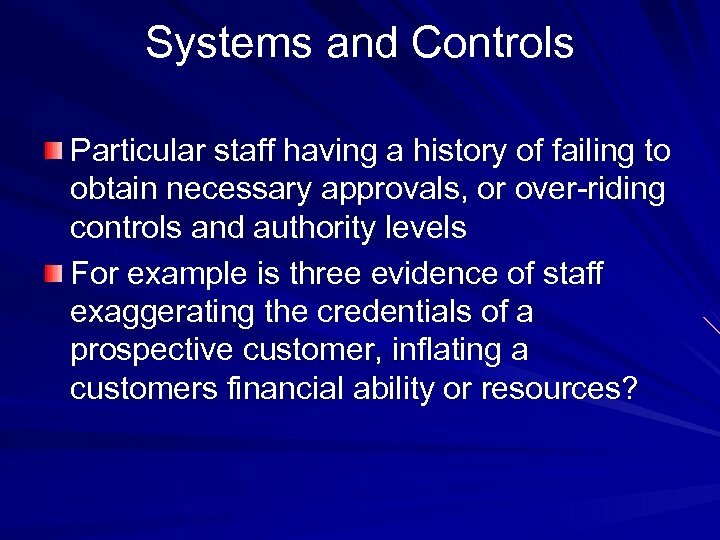 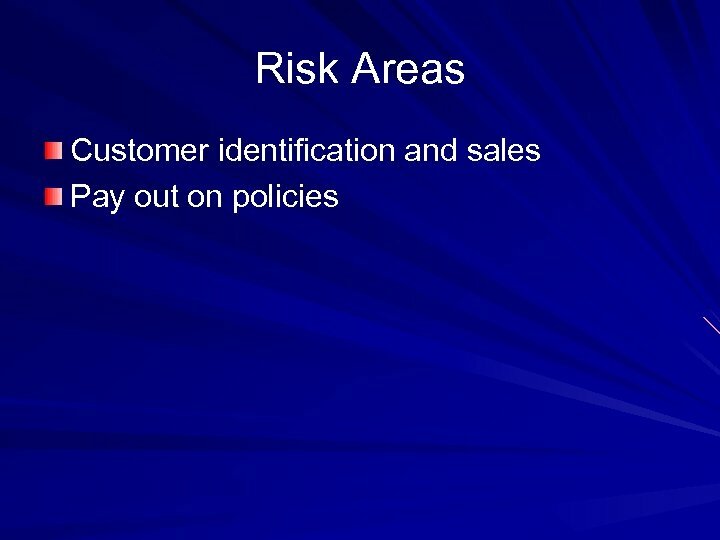 Systems and Controls Particular staff having a history of failing to obtain necessary approvals, or over-riding controls and authority levels For example is three evidence of staff exaggerating the credentials of a prospective customer, inflating a customers financial ability or resources? 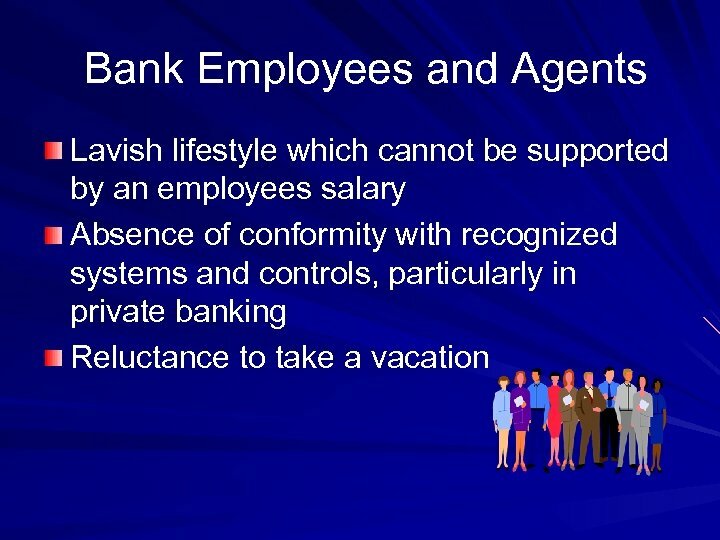 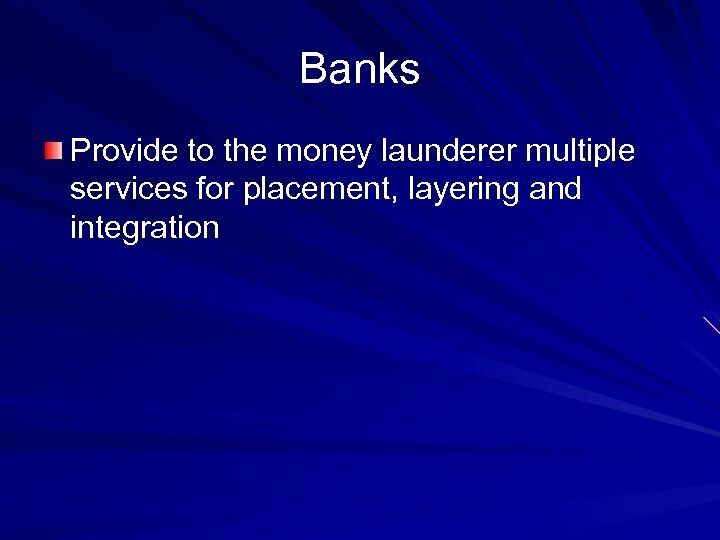 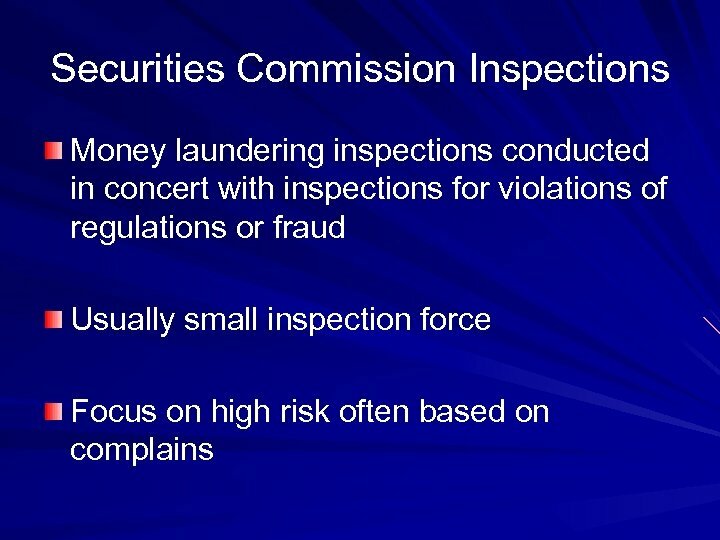 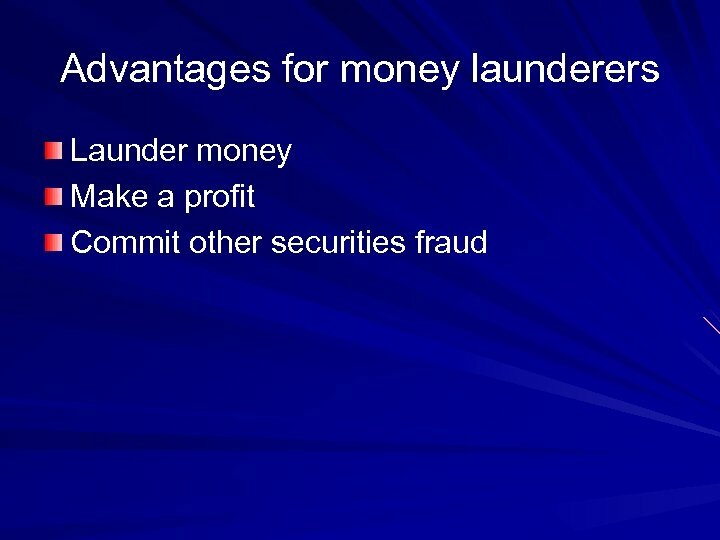 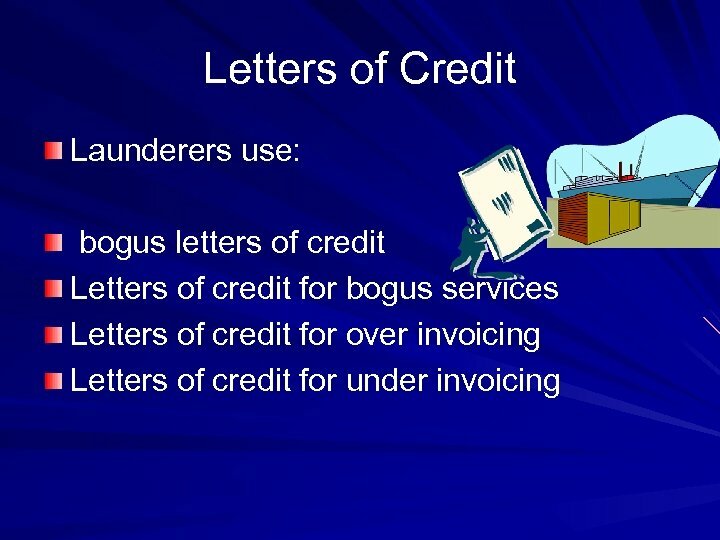 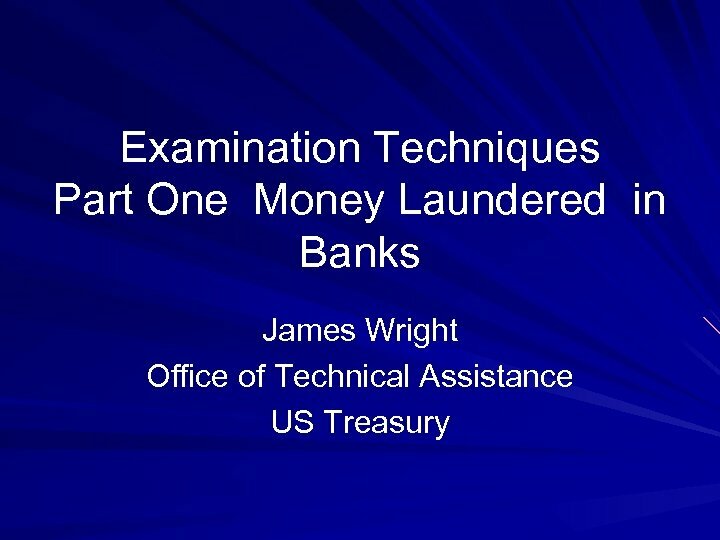 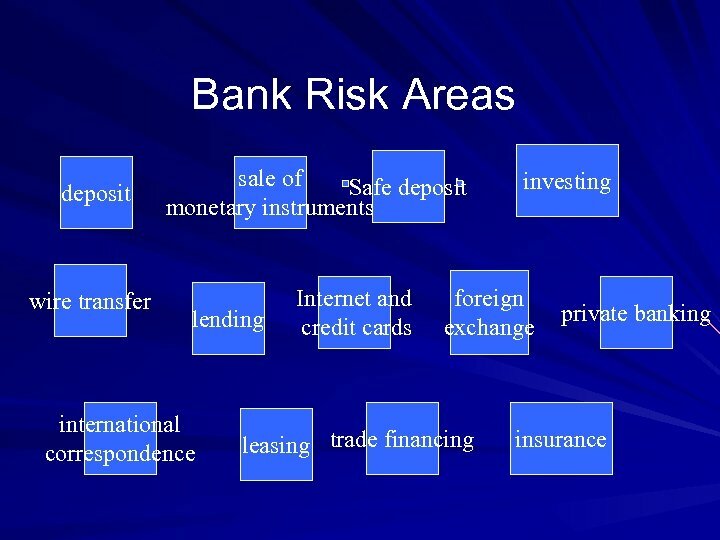 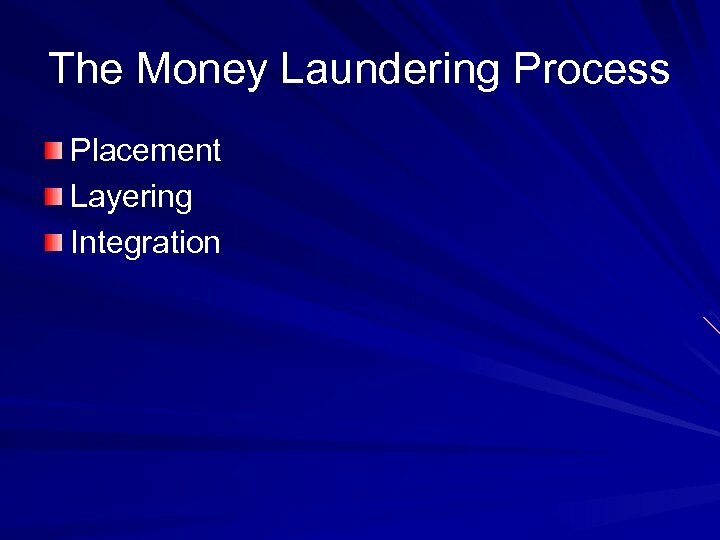 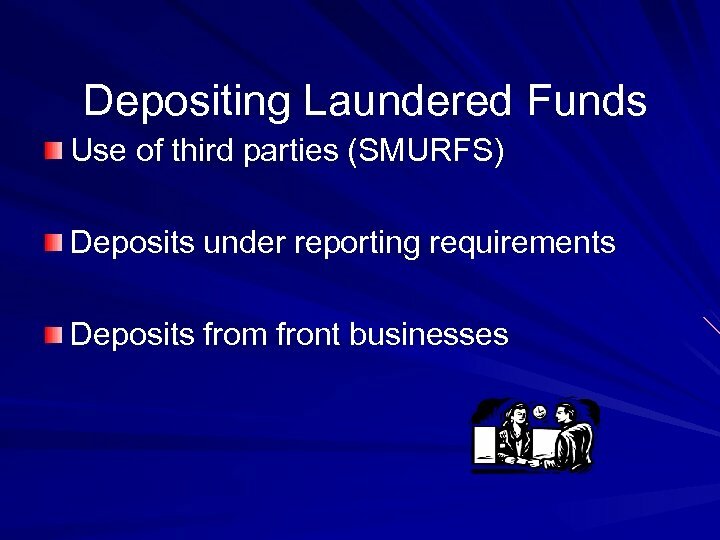 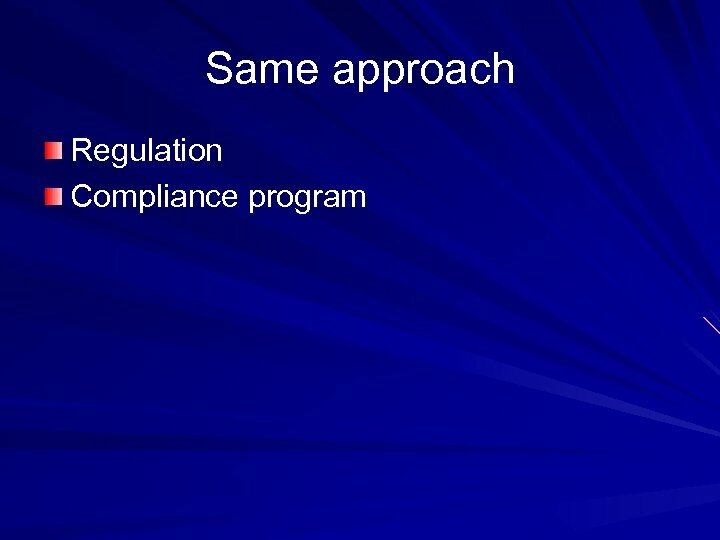 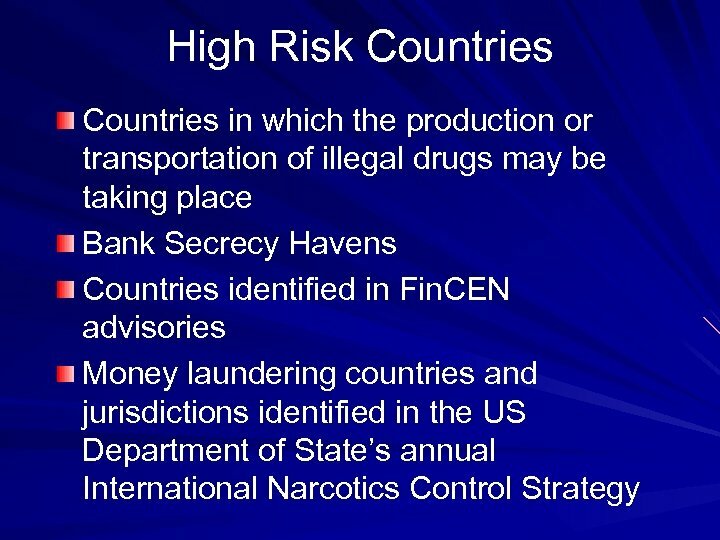 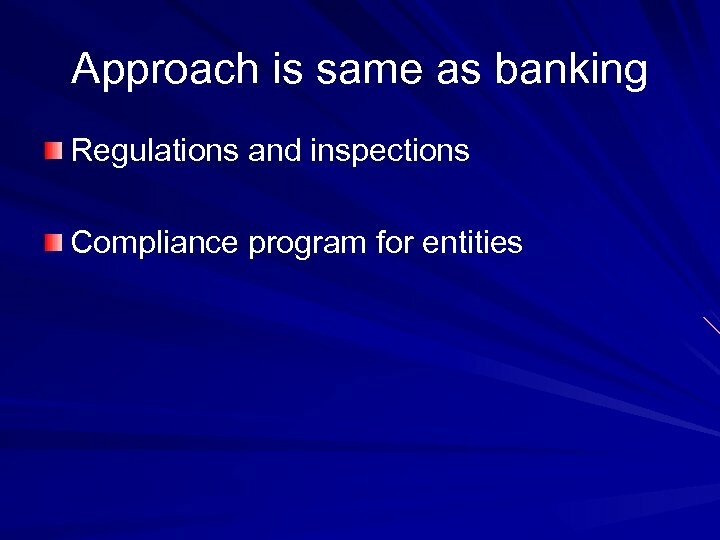 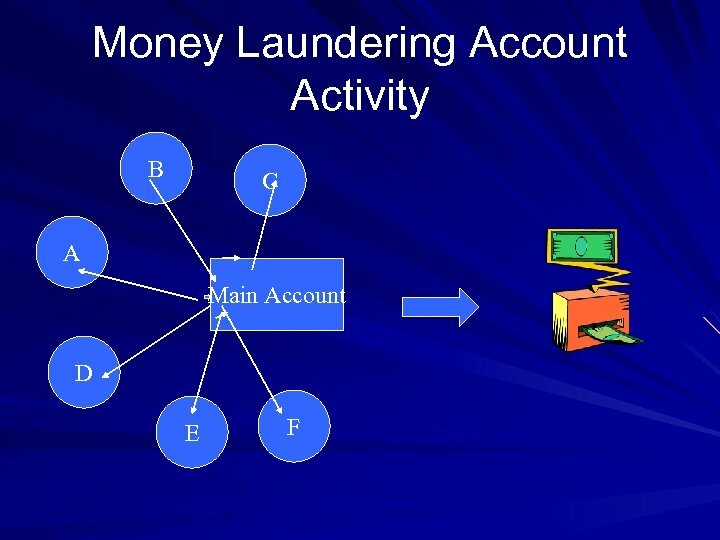 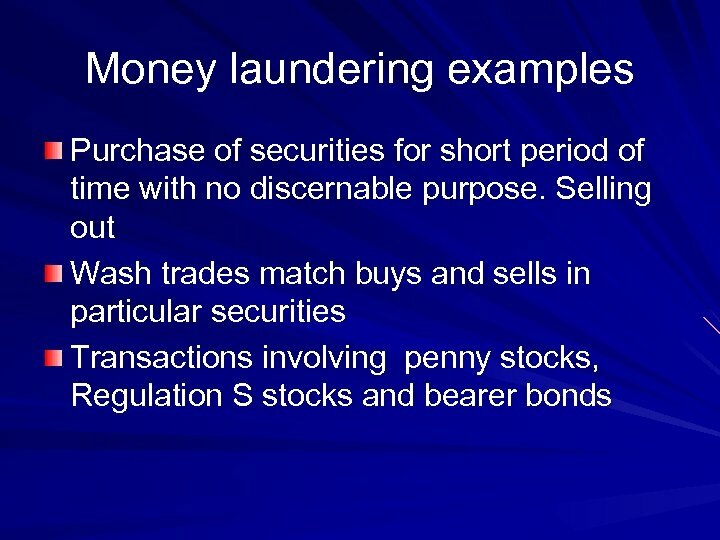 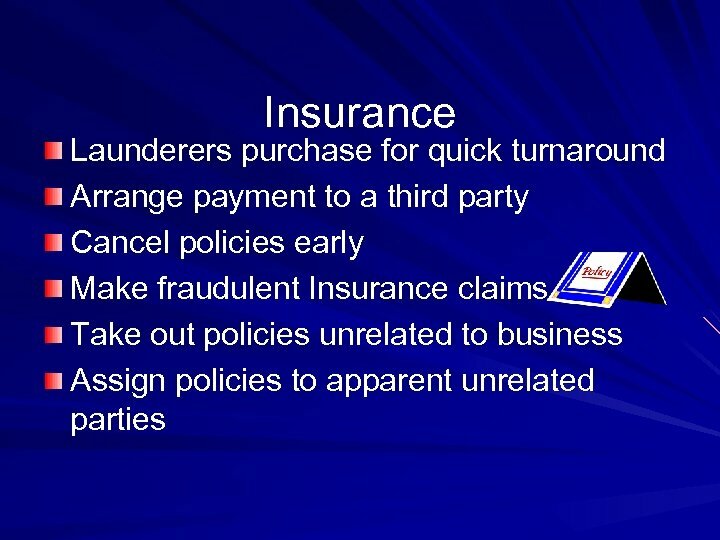 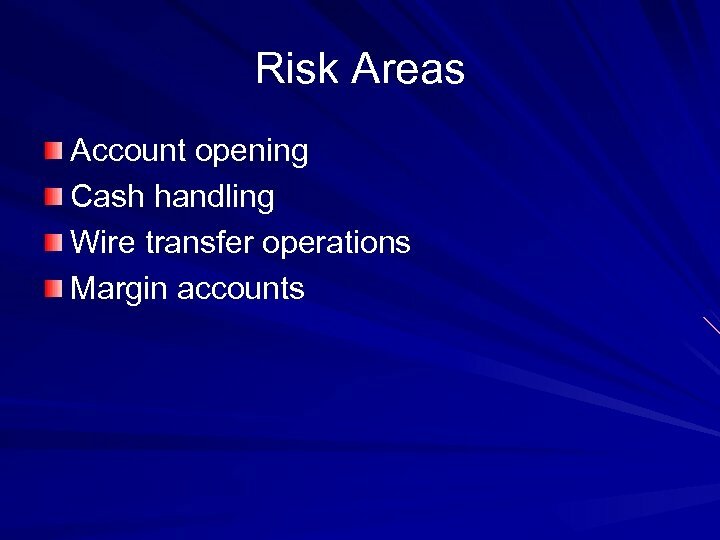 New Money Laundering Schemes Each Year the Financial Action Task Force Shares information on new money Laundering schemes. 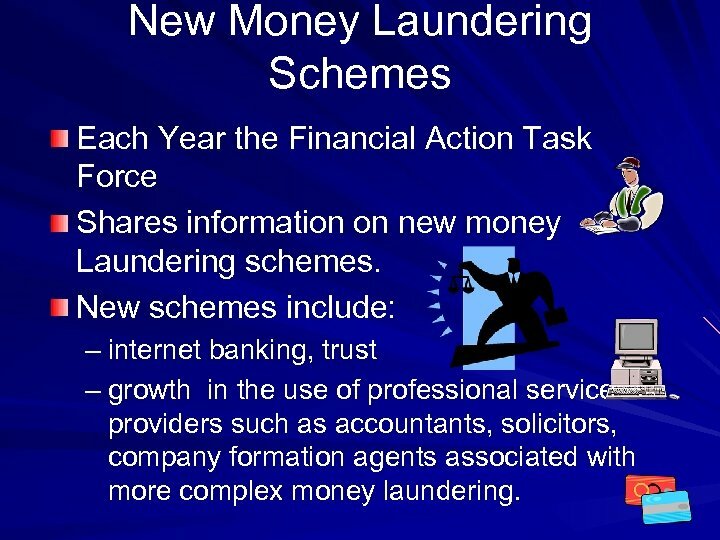 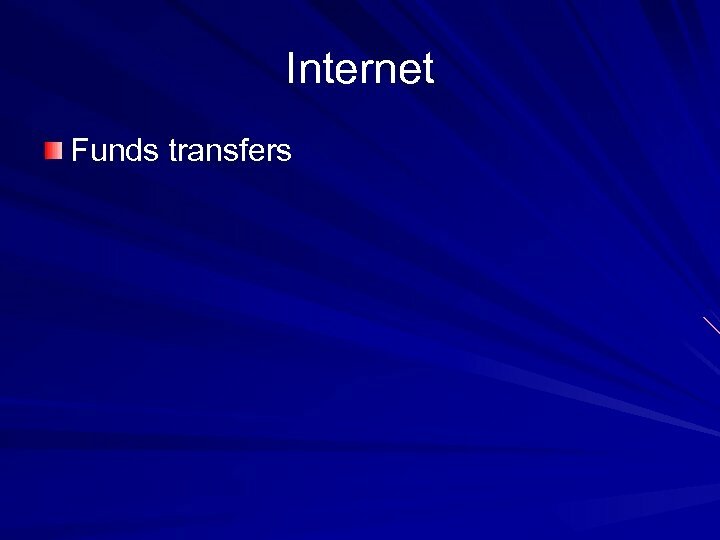 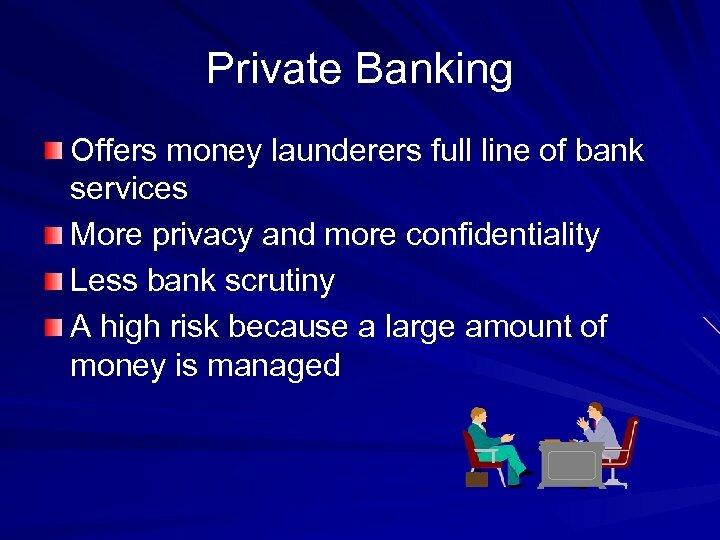 New schemes include: – internet banking, trust – growth in the use of professional service providers such as accountants, solicitors, company formation agents associated with more complex money laundering.